Well, it’s a multiplayer game where 100 people start in an aircraft that flies over a quite large map, and every individual player can decide when to jump off, which works like in real life with a parachute of course. Depending on the game mode solo or team, there will only be one person or one team that can win! Why? Because that’s what the game is about. Every stranger you meet in the game is an enemy and wants to win, and they’ll fight tooth and nail! The map is quite large, and jumping off the plane is a strategic decision. You definitely have to jump, but you need to decide where and when you want to jump. You will have no weapons, but it’s in your interest to collect them when you are at the ground. And everyone will do it because they want to be those that survive. That means as soon as you are on the ground, you will need to search through buildings to find weapons and other equipment that will help you to survive. That’s why it is so important to decide where to land, because if another player lands near you and finds a weapon first, you will be done. But again, the map is super large (8x8km), which means you can play on a way that people don’t find you right away. But you might wonder how people will find each other if the map is that large. Well, the game will force you to meet each other at some point. At first there is a super large circle on the map and you need to get there because if you are outside of the circle, you will take damage at some point. Yes, it’ll kill you if you don’t get into the circle fast enough. But the first circle is large. With time the circle gets smaller, and again smaller. You see the point. There is a mechanic in the game that will force people to fight each other at the end of the game. And since only one individual or one team can survive, it’ll be dangerous the smaller the circle becomes. This means at the start of the game you have enough space to hide, it’s as said a really large map, but at the end of the game people will come together and that’s where it gets super strategic and dangerous because they will be just meters away from you. That’s it, you could say it’s Hunger Games in the form of a PC game, and it can be played in first person and third person view. Unlike in other shooter games, the weapons are also more realistic or more difficult to use. Killing another player at distance is not as easy as you know from other games, but when you hit someone, it really deals damage. Yes, bullets will lose energy and drop off in the distance, which means you have to think about this when you shoot targets in the distance. And since all other strangers are your enemies, the sound of your shots might also attract attention, and that might eventually lead to your very own early elimination if others find you. This is what I love about the game, it’s thrilling and more than just shooting at enemy players. It’s also like playing hide and seek, and hiding can in many situations even be more beneficial than shooting. That’s my experience as a player who is regularly in the top 20 of last surviving people, because some players simply go all-in too early, maybe because that’s what they are used to from other shooter games. 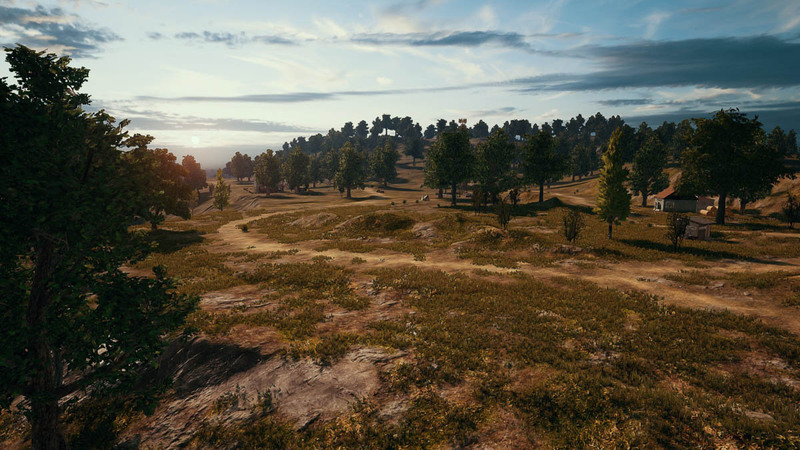 So, if hide and seek is your thing as strategic playing, PlayerUnknown’s Battlegrounds is definitely a game for you. I had incredible fun in PUBG, and I see myself spending more time in this game. It’s just sad that I for now couldn’t manage to convince my friends to play the game with me, because also they understood that it’s a very punishing game. You either survive, or you will need to restart a fresh round with other people. You don’t have two or three lives, no, it’s just one life and if you are shot, you’re out. But hiding and trying to survive, that’s so addicting that you constantly hit the “Play” button again once you lost or won a match. Ironically, it’s been a while since I experienced this in a game again. Modern games try to grab your attention by rewarding you with achievements that pop up on your screen, but this game doesn’t come with any of those psychological tricks, it’s just that the game is so much fun that you want to play one after another round. If you think this game could be for you, I suggest you to give it a try. Yes, it’s a game that will punish you if you do something wrong, but that’s the excitement, that’s what the game is about. It really gives you a thrill, something that is harder and harder to find in the modern days of gaming because it’s today all about graphics instead of innovative gameplay. I hope you liked this small review. Feel free to drop your opinion in the comment section below, and I’d be glad if you share the article with your friends. Happy gaming!